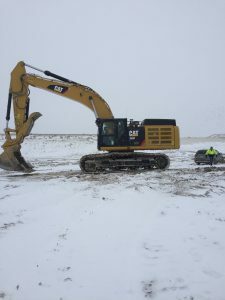 Published on February 2, 2019 in Equipment & Products, Featured Article and National. 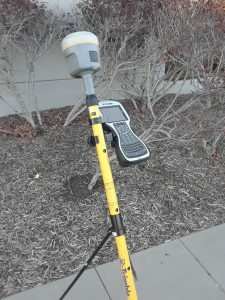 Closed Tags: construction, construction industry, contractors, employment, equipment, excavators, GPS machine control, GPS machine control system, heavy equipment, Johnny Ball, Machine Control, safety. Ask the average person on the street where garbage goes after the garbage truck picks it up and takes it away, and most will likely say, “the dump.” At one time, most communities had a town dump located near the edge of town or just outside. That was where town-folk could toss out anything. One can imagine Andy and Opie hauling an old chair that Aunt Bee wanted out of the house to the Mayberry town dump. Fortunately, in 1976, eight years after the last episode of The Andy Griffith Show aired, the United States government passed the Resource Conservation and Recovery Act. This law put new rules into effect to protect water supplies and control how trash was thrown away. As a result, many dumps were closed or changed to follow the new rules. Today dumps are illegal, and trash is taken to a landfill. Modern-day landfills are sophisticated operations and are designed to receive garbage and keep the environment safe. 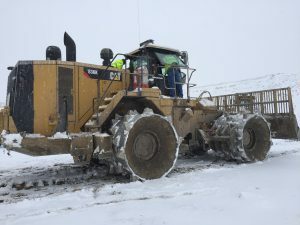 A landfill has a liner system at the bottom to catch toxic waste that could pollute groundwater Trash is piled and smashed down to “fill” the landfill space. into the project. 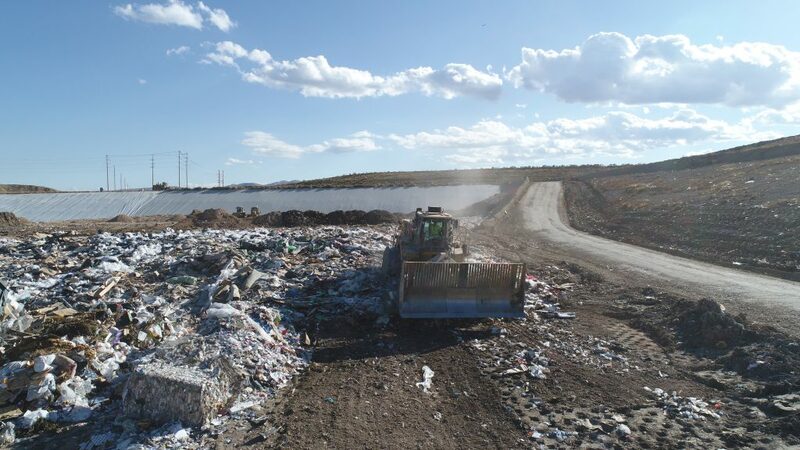 Currently, the Trans-Jordan Cities Landfill is now owned and governed by seven cities with several other non-owning cities also bringing their Municipal Solid Waste (MSW) to the site. 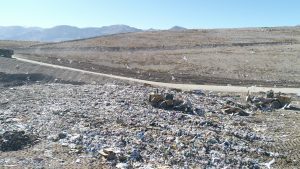 The once Mayberry-style community dump is now a technologically advanced, sophisticated landfill serving approximately 500,000 residents, as well as accommodating the commercial waste from the same south half of Salt Lake Valley region. There is also a public convenience center (PCC) for residents to drop their trash on a hard, concrete surface with recycling of many materials including metal, carpet pad, Freon containing appliances, electronics, and second-hand store donations. Another service offered is a Household Hazardous Waste (HHW) collection and processing facility–free to residents and fee-based for small businesses. 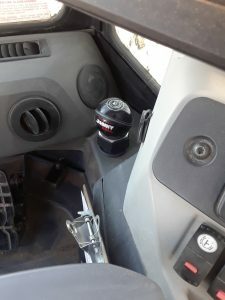 Base cups for JohnnyBall have been mounted in seven Trans-Jordan machines–dozers, compactors, an excavator, and a motorgrader–which enables the four JohnnyBalls they currently own to be moved seamlessly from machine to machine as needed. The Old Cell 6 Trash Relocation Project was completed in two phases. The company cut half of the old MSW and relocated it from August 2014 through Sept 2015. Phase 2–the other half–started up in May 2017 and finished October 2018.